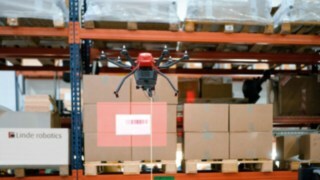 The use of drones can dramatically simplify the stocktaking of inventories in the future. At the LogiMAT trade fair in Stuttgart, manufacturer and solution provider Linde Material Handling is presenting the prototype of just such a stocktaking drone. By coupling the drone with an automated pallet stacker, continuous power supply and tracking in the hall are guaranteed. First of all, there’s a buzzing sound and then the stocktaking drone “Flybox” from Linde robotics and Balyo takes to the air. Approximately 50 centimetres wide, equipped with six rotors, camera, barcode scanner and telemeter, it slowly makes its way up the front of a rack, taking a photo of every pallet storage location and capturing the bar codes of the stored goods. When it reaches the uppermost rack, it moves to the right or left in sync with the pallet stacker on the ground and continues its documentation process from the top to the bottom. Then it moves on to the next position and up it goes again – repeating this in waves, until it has captured the entire rack and its pallets and the information has been transferred to the computer. There, everything is documented and can be brought up at any time by means of application software which displays the rack position on the screen including the corresponding barcode and photo. During stocktaking, the “Flybox” is guided by a Linde L-MATIC. Drone and robotic vehicle are connected via a voltage converter and a self-adjusting cable. 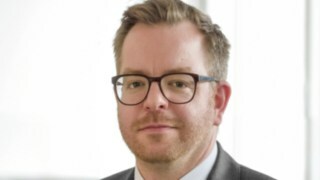 “The decisive new feature of this invention is that we use the drone together with an autonomous industrial truck,” says Tobias Zierhut, Head of Product Management Warehouse Trucks at Linde Material Handling. 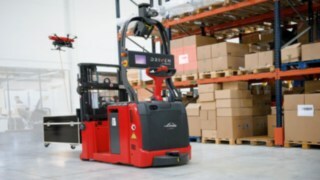 During its stocktaking mission, the “Flybox” is guided by an automated Linde pallet stacker, the L-MATIC. The two vehicles are connected to each other via a voltage converter and a self-adjusting cable. At the LogiMAT trade fair 2017 in Stuttgart, manufacturer and solution provider Linde Material Handling presents the prototype of a stocktaking drone. By coupling the drone with an automated pallet stacker, continuous power supply and tracking in the hall are guaranteed. With this innovative coupling, Linde has resolved two challenges that have hitherto impeded the use of drones in warehouses: power supply on one hand (drone batteries usually only last 15 minutes) and the localisation under the hall roof without GPS reception on the other. Thanks to innovative geonavigation, the Linde system always knows exactly where the drone is located: The vehicle transmits the surface coordinates, a height sensor installed in the drone measures its respective altitude. 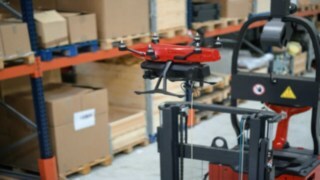 The drone takes a photo of every pallet storage location, captures the barcodes of the stored goods and transfers the information to a computer. The drone, which is being developed by Linde Material Handling together with French automation expert Balyo, is designed to dramatically simplify the legally required stocktaking processes and thus save valuable time and costs for companies. According to experts, companies spend up to eight percent of the inventoried stock value to pay temporary staff or their own employees, procure forms and provide auxiliary equipment. At the same time, the manual counting process interferes with operations and errors, accidents or damage to goods and equipment occur time and again. The information captured by the drone is computer documented and can be brought up at any time by means of specific application software, which shows the rack position on the screen, including the corresponding barcode and photo. With the “Flybox”, all these problems could soon be a thing of the past. The drone is designed to work completely autonomously and carry out stocktaking outside regular working hours – at night, at the weekend or during the Christmas holidays, for example. Linde Material Handling plans to offer the “Flybox” in the future as optional extra for use with its automated MATIC vehicles. The drone is to be delivered in an approximately 1.5m x 2m stacker-compatible crate. This can be easily positioned on the load arms or forks of a Linde robotics truck when the next stocktaking procedure is due. Once the drone has scanned all of the given rack positions, it returns to its “landing place” and awaits its next assignment, stowed in the container. 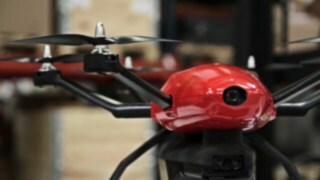 The drone presented at the LogiMAT is a prototype. 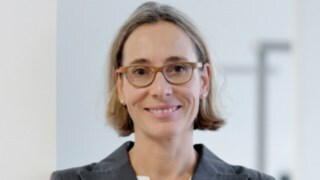 Market launch of the “Flybox” is scheduled for 2018 at the earliest. The LogiMAT stand of Linde Material Handling can be found in Hall 8, Stand B21.